Although Harmony Server opens palettes in read-only mode by default, there is always the possibility of palettes that are shared between scenes getting modified or their swatches getting deleted by accident. That is why it is a good idea to copy and back up your palette libraries, your master palette directories and your colour models. If you open a scene and a palette file happens to be missing, it will still appear in the palette list for that scene or element, with a strike through across its name. When Harmony attempts to load a drawing that uses colours from a missing palette, or colours that were removed from their palette, it will display the zones painted with the missing colours in red. Then, it will prompt you to recover the missing colours into a recovery palette. A recovery palette is based on the colour information which Harmony stores in each drawing as a backup mechanism. This palette is stored at the scene level, and is not shared or sourced externally. Whether you choose to perform colour recovery or not, your artwork will preserve the colour IDs which Harmony uses to associate brush strokes, pencil lines and filled zones with the colour swatches in your palettes. Hence, if you recover your original palette, you can just import or link it back to your scene—and remove the recovery palette, if you have one—and Harmony will automatically associate your artwork with the original palette again. You will not have to repaint your drawings. You can backup your palettes by copying them manually using your operating system's shell, or by cloning them using the Palette Operations dialog. 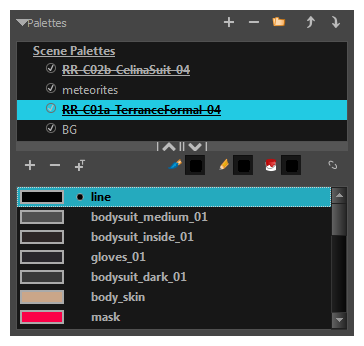 In both cases, the palette preserves the colour IDs, making it easy to replace a missing palette with its backup. For more information on the Palette Operations, see Palette Operations.